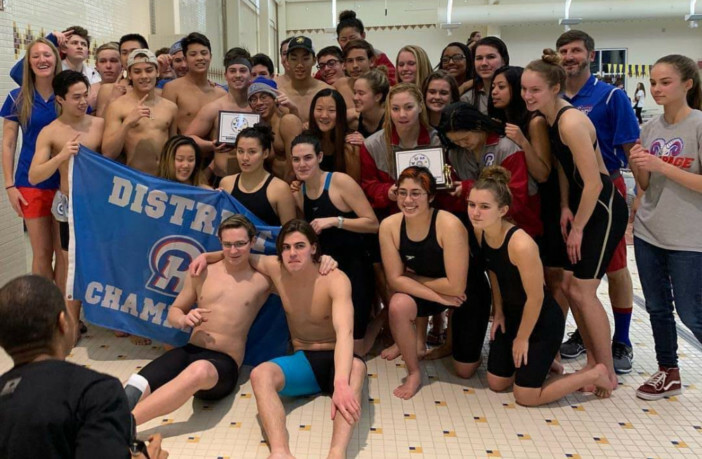 Sterling, Va. — Backed by eight individual championship swims, the Riverside High School boys and girls swim teams claimed the Dulles District championships on January 26 in Sterling. On the boys side, Riverside senior Jackson McCummings won the 50-yard freestyle, sophomore Christopher Kopac won the 500-yard freestyle and sophomore Robert Quan won both the 100- and 200-yard freestyle events as the Rams swam past Dominion, 467-344. On the girls side, Riverside junior Allison Kopac won both the 100- and 200-yard freestyle and senior Claire Nguyen won both the 50- and 500-yard freestyle events as the Rams again defeated Dominion, 470-398. In their runner up efforts, Dominion sophomore Andrew Blusiewicz won the boys 100-yard breaststroke, junior Ashley Bogushefsky won the girls 100-yard backstroke, freshman Natalie Schlemmer won the girls 100-yard breaststroke and senior Rachel Schlemmer won both the girls 100-yard butterfly and 200-yard individual medley.